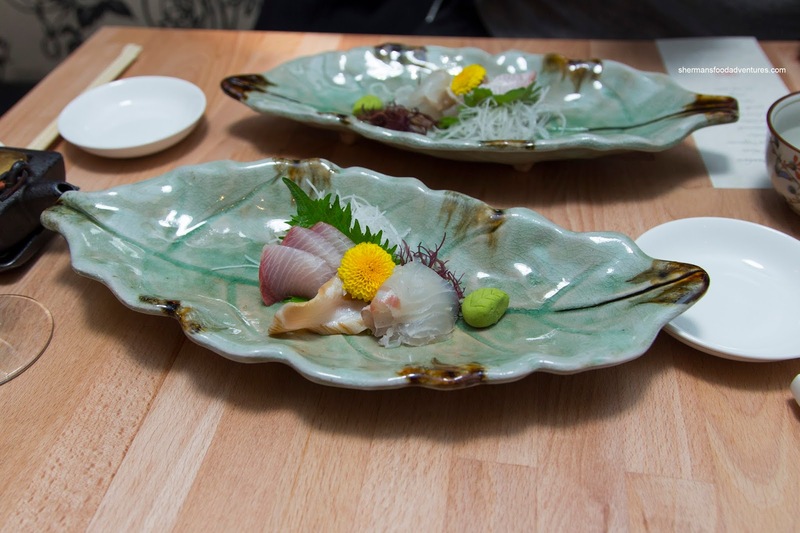 If you weren't aware already, there are over 600 Japanese restaurants in the Lower Mainland. So no one can say that it is under-represented. However, if we look more closely, the bulk of them are not truly authentic. Yes, we are subjected to the dreaded "value" sushi that is neither carefully made nor consists of high-quality ingredients. Hey, I'm not being a food snob as I frequent these places because they do give the best bang for the buck. However, we are seeing some higher-priced authentic sushi bars popping up that focus on quality rather than quantity. Located on "hipster light" Fraser Street, Masayoshi offers 2 Omakase experiences including the $120.00 Original Creation that requires 3 days advanced reservations. Joining me for this meal was Emily who happens to be a very picky eater, especially when it comes to sushi. 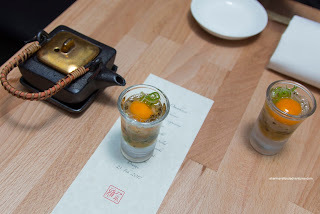 We began with the Baby Eel Shooter that was sweet and fairly tart. Everything went down smooth including the silky egg yolk and surprisingly buttery eel. The brightness of the green onion provided some balance as well as some texture. Next up was the Firefly Squid Cappuccino with mushroom and burdock broth. This was smooth, hearty and creamy with hits of strong Earthiness not only from the mushrooms but from the herbal burdock. The smooth and buttery squid provided little bursts of texture and light sweetness. Too bad this was so small because it would've been more effective as larger portion. The Sashimi course consisted of amberjack, murigai and tai. At first, we were rather dismayed with the fish selection (except for the murigai), but for me at least, it was mitigated by the quality. Normally, tai (snapper) can be a pretty pedestrian choice at most value sushi restaurants. Not here though as it was super buttery and fairly sweet. 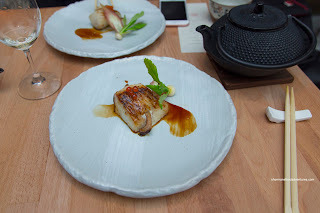 Emily wasn't as enthused, but for me, it was some of the best tai I've had in Vancouver. My thick slice of murigai was sweet with a firm bouncy chew. The amberjack was pretty sweet and buttery as well. 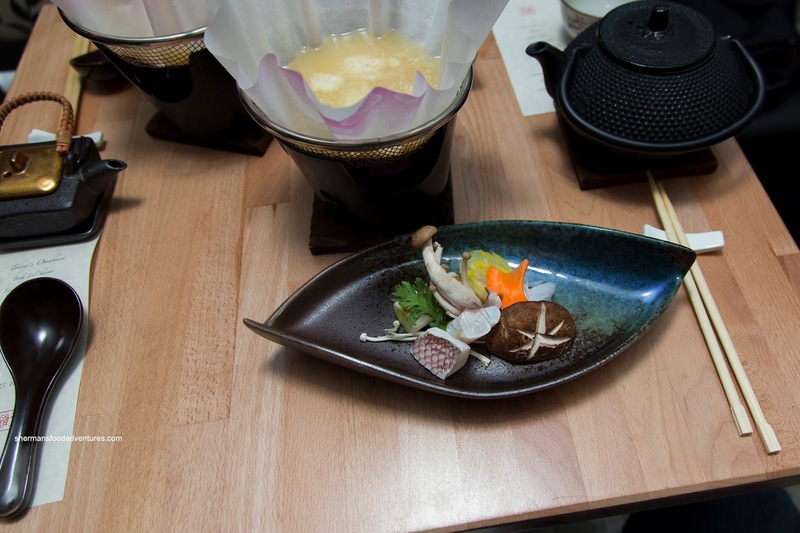 Moving on, we were served the Chawanmushi with edamame, eel, baby scallop, clam, chicken and tobiko. I enjoyed that it was served at the right temperature as the silkiness of the egg was highlighted. It was a touch briny and sweet benefiting from the host of ingredients. The pops of sweetness and added brininess from the roe was also a textural delight. 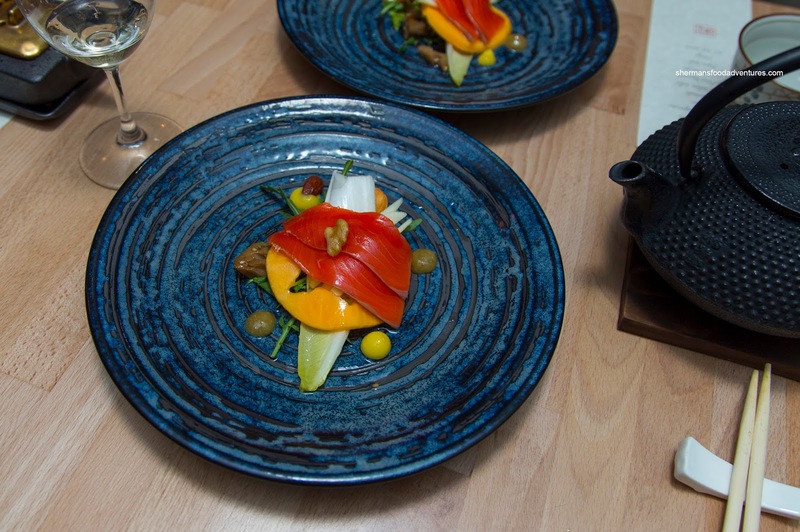 My favourite dish of the meal was the Smoked Salmon atop papaya, arugula, picked lotus root, various nuts and an acidic vinaigrette. It was served table side covered by glass cloche of smoke. Hence, when it was removed, our senses were heightened with smokiness. As for the salmon itself, the smokiness was actually rather light while the texture was buttery. The powerful vinaigrette added a punch to the dish that actually masked the mild papaya. Onto our cooked course, we had the Black Cod Kasuyaki with micro turnip and eel sauce. Interestingly, my piece of cod was larger than the other, hence it was more buttery and flaky. The other portion was slightly smaller and it ended up to be a few seconds more done. Whatever the case, it was delicious highlighted by the mild sweetness of the sauce. The fish itself could've benefited from a touch more salt. We were then each served our own Soy Milk Hotpot with snapper, mushroom and cabbage. 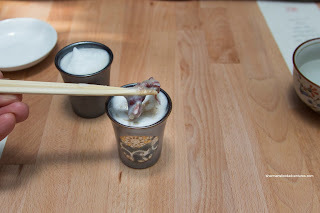 I'm not a huge fan of soy milk, but the broth was nicely balanced where it was lightly sweet. This was an interesting dish, but the doneness of the ingredients were solely up to each individual. 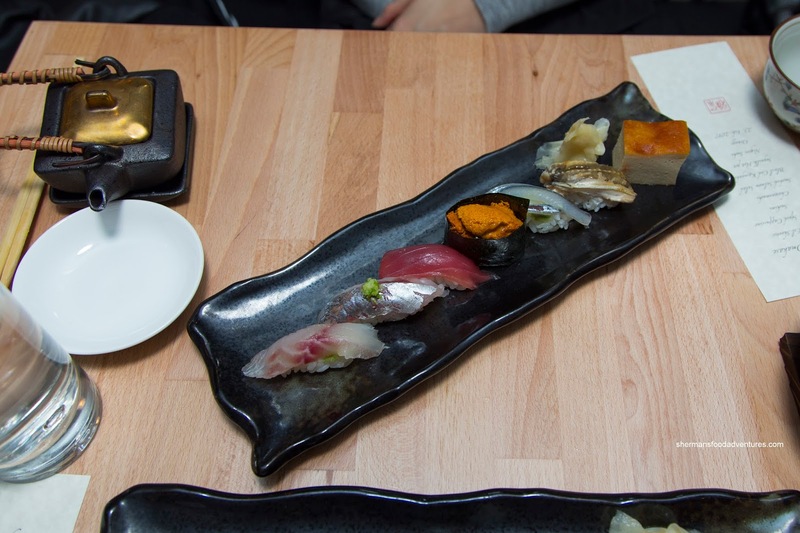 The Nigiri course was something we were looking forward to and it looked beautiful on the plate consisting of grunt, aji, bluefin tuna, uni, needlefish, freshwater eel and tamago. I really enjoyed the grunt as it was sweet and tender with a light chewiness. The aji was predictably more robust with a fishier essence (hence the ginger and onion condiment). The bluefin tuna was buttery and only lightly sweet while the uni was silky and intensely sweet. House-made and unique, I personally wasn't a fan of the dense and sweet tamago. Interestingly, the sushi rice was on the drier side and crumbly. Not really our preference either. 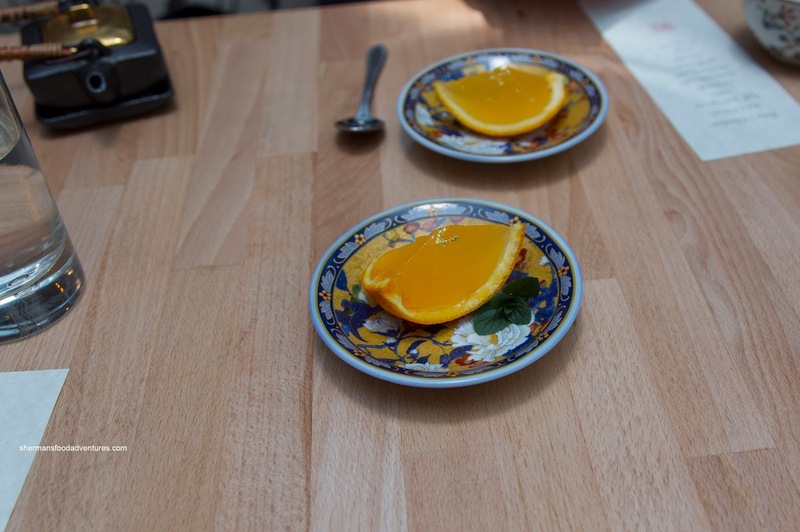 For dessert, we were served a slice of orange peel reconstituted with Orange puree gelee. This was simple, yet deliciously refreshing and natural tasting. It was totally as if we were eating the slice of orance without the texture. 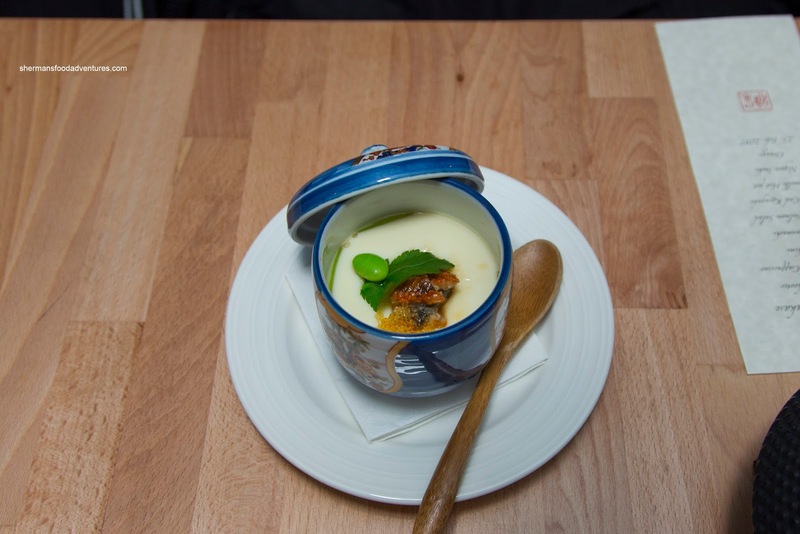 As for the gelee, it was not particularly smooth, but the robust clumpiness added an appealing texture. 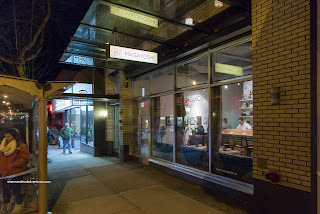 Overall, we enjoyed our meal at Masayoshi, but it didn't necessarily blow us away. Considering the price, I guess that may have had something to do with it. Whatever the case, there were some real gems in the tasting menu though.